It’s no secret that Google knows a lot about you. The company tracks almost everything you do on the Internet, including your searches, music you listen to, videos you watch, and even the places you travel to, and it does this for targeting relevant ads to its users and better improve its service. Now the technology giant has a plan to make it easier to control all the data the company collects throughout all your different devices. Google has rolled out a new My Activity page that shows a searchable history of pretty much everything you do online, including previously visited websites, voice searches, searched things and places, watched Netflix programs, and all activities you did on each of its products. "My Activity is a central place to view and manage activity like searches you’ve done, websites you’ve visited, and videos you’ve watched," Google says. "Your activity is listed as individual items, starting with the most recent. These items might be part of bundles, which group similar activity together." Google products that the My Activity page hold include Ads, Search, Android, Play, Chrome, YouTube, Video Search, Image Search, Maps, News, Now, Books, Developers, Finance, Help, and Shopping. Soon you will also see a prompt on Google services asking you to check your security settings. A new opt-in option will ask if you want to personalized ads based on your age, gender, and search history to display on third-party sites, reports Wired. By opting in, you will let Google use all of the information related to your account across services including Search, Chrome, and YouTube, to offer better ads for you across the Web. The feature is beneficial for those who want more granular control over how ads work across all their devices linked with Google account and gives them the ability to block some ads they don’t want to see. For example, if an ad for mobile phone haunts you across the web, you can kill that ad from everywhere, all at once, rather than going device by device. However, the feature also offers you an option to delete items as well — everything in a particular date range or by specific topics. If you are one of those privacy-conscious hawks, you can adjust your settings in the Privacy Checkup. 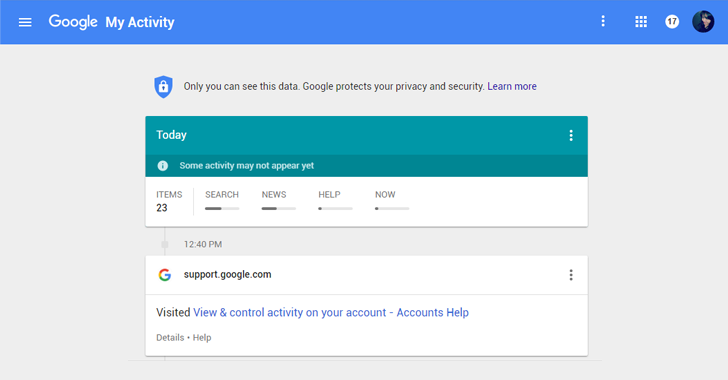 You can change your settings for ultimate privacy, depending on how much of your online activity you allow Google to track. You can even suspend web and application activity tracking for My Activity, but that could impact the features like autocomplete suggestions.